The Midea Fully Automatic Washing Machine 7kg MFW-701S will pile up the clean laundry in your home in no time. This fantastic, reliable and strong washing machine is easy and effortless to use. With just one or two clicks and a bit of detergent, you will be ready to transform your dirty laundry into freshly-washed and rinsed clothes. The Midea Fully Automatic Washing Machine 7kg MFW-701S has a large capacity of 7 kg ensuring that you can put in a huge pile of your dirty laundry at one go. The Midea Fully Automatic Washing Machine 7kg MFW-701S is sleek and modern in design. It is a top loading washing machine with a tempered glass display panel which displays time and other information such as On/Off, Start, Wash Option and so on. Its free standing design with adjustable feet allows you to move about the machine with little effort. The washing machine comes with a power off memory system which enables you to continue interrupted washing cycles from it was left off with its built-in memory. The Midea Fully Automatic Washing Machine 7kg MFW-701S comes with awesome cleaning functions to ensure that all your clothes are spotless as possible when it comes out of the washing. 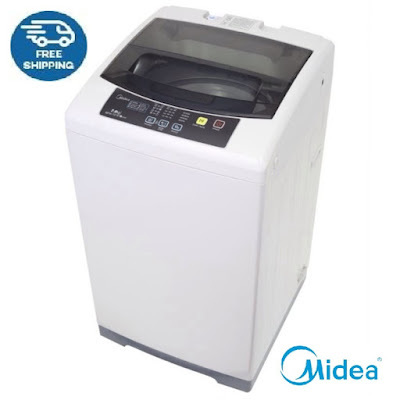 The Midea Fully Automatic Washing Machine 7kg MFW-701S’ stainless steel drum with metal body is durable, long-lasting but is not the only special feature of the washing machine; the washing power of the bag-type filter prevents soap and lint built-up in the laundry tub. The uniquely-designed filter collects lint, removes and clean the lint. Midea Group is a global manufacturer of home appliances and HVAC solutions. Since its commencement as distributor for Midea Household Electrical & Electronic Home Appliances and Air-Conditioners in 2006, Midea Scott & English has provided Malaysian consumers with modern, high quality Midea products. Supported by sales & service centres located throughout the country, the company’s philosophy is to ensure customer satisfaction with quality products that are accessible to all Malaysian consumers.